The versatile and compact Magimix 11650 Food Slicer offers amazing performance is and simple to setup and use as well as being ideal for slicing cooked meat and poultry. It is also easy and quick to clean as you can remove the blade and can be washed quickly and easily with warm soapy water. Made to exceptionally high standards, the Magimix 11650 Food Slicer can be adjusted to cut between 0-2cm slices and provides a professional finish. Features also include a stainless steel blade and finger safety guard. However we would suggest that this model is only suitable for domestic use. 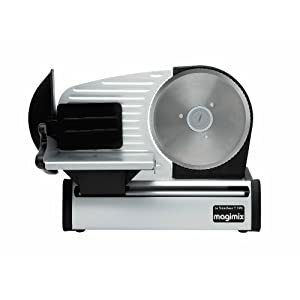 The Magimix 11650 Black and Stainless Steel Metal Food Slicer accurately slices cooked meats, salami, sausages, bread and cheese and is the perfect food slicer for use during the festive season. The Magimix Vision Toaster with see through sides allows you to see how your toast is cooking with quartz elements this is the ultimate toaster in design and looks and is available in black and chrome. Magimix is set to revolutionise the way we look at toast with its ground breaking Vision Toaster. Incorporating the stylish, sleek design lines that are synonymous with Magimix, the Vision Toaster is the very first of its kind to boast clear glass sides which allow you to see your toast as it browns and ensure that every piece is the way you like it. The Magimix Vision Toaster also has an extra wide slot with automatic bread cantering and an extra lift lever to allow smaller pieces to be removed safely and the result is a brand new, versatile toaster which not only toasts bread to perfection, but can also be used for warming or browning baguettes, muffins, crumpets, buns and teacakes too. The toaster also has defrost, bagel and reheat functions. There is also a variable browning control and slide out crumb tray The double insulated glass windows have been carefully designed for easy cleaning so the machine stays looking good.